Obtaining the public key of someone has always being a major pain point of using GnuPG. OpenPGP doesn't "outsource" trust management by using a PKI. Instead, it allows each user to decide whom to trust. This has the downside that we need to evaluate whether we can trust a new public key for each new communication partner. Until recently, there wasn't an automatic way to securely get the public key of someone you never communicated with. The Web Key Service and the --auto-key-retrieve & --auto-key-locate enhancements available in GnuPG 2.1.16 and beyond. There exists only one key server for a given email address. No need to ask multiple servers as with HKPS. 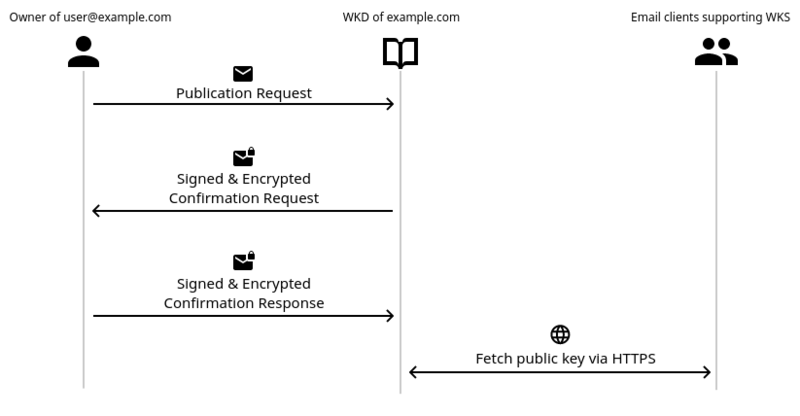 When publishing a public key using mail, WKD makes sure the sender is in possession of the secret key. Email providers can (and should) make sure that only the owner of the email account is able to publish a public key for it. Point three helps us with trust management. In case we trust the email provider of our communication partner, we can trust the key retrieved by WKD more than one from an HKPS based key server. In order to use WKS you need a provider who supports it 1. After you configured the email account in Thunderbird you need to enable OpenPGP for it and generate a key pair. Figure 2: Enable the OpenPGP checkbox in the account settings. Then, open the key management window and find your public key. Right clicking it opens the context menu. 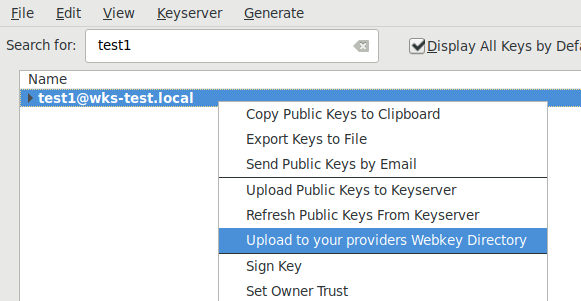 There, select the option to upload the public key to your provider's WKD. Figure 3: Context menu of the key management dialog. After submission, the WKD will send an email to you asking to confirm the publication request. The subject line and body copy can be defined by the WKD but Enigmail will display a yellow bar above the message announcing it is a confirmation request. Clicking the button on the right will send the confirmation email to WKD. Figure 4: Enigmail adds a yellow bar to the confirmation request. After the email has been sent, your public key will be accessible to everybody. Recent version of Enigmail receive missing public keys automatically form multiple sources, including WKD. Everybody who wants to send you an encrypted email will be able to do so without finding your public key manually first. This is a bit anticlimactic, but you can use the --auto-key-locate option to retrieve your own public key from the WKD to see if it worked. Fixed URL auf the Web Key Service draft and updated to the current -04 version. As the time of writing only Posteo supports WKS. These web pages are Copyright 1998--2017 The GnuPG Project and licensed under a Creative Commons Attribution-ShareAlike 3.0 Unported License. See copying for details. Page source last changed on 2017-09-13.